In a recent application, a customer needed a flexible system that could handle many different sizes and patterns of cases in order to more effectively stack them on a pallet. See a video of this application at the end of the post! Dorner created a system that allows the customer to create any pattern of cases they need. The cases enter the system single file and an Intralox DARB Sorter moves the cases perpendicular onto one of two lanes. 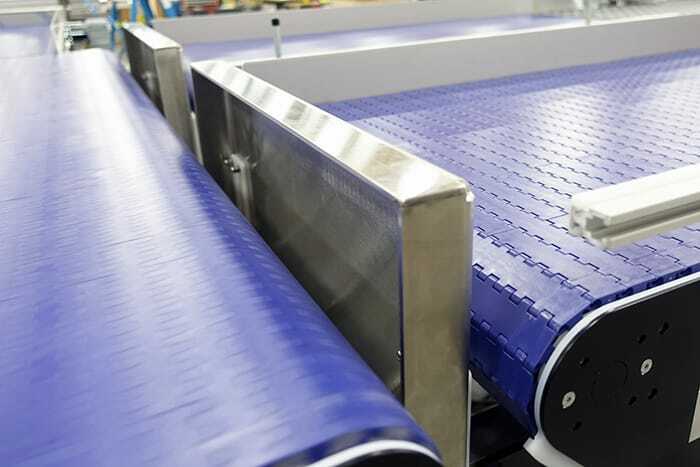 On each lane, a passive 3200 Series Conveyors with Intralox Activated Roller Belt™ (ARB) Technology justifies the package along a roller guide. If the package is in the correct orientation it flows straight onto a 3200 Series Modular Belt Conveyor. If it is not in the correct orientation, a pneumatic pop-out bump turn will activate and rotate the package 90°. 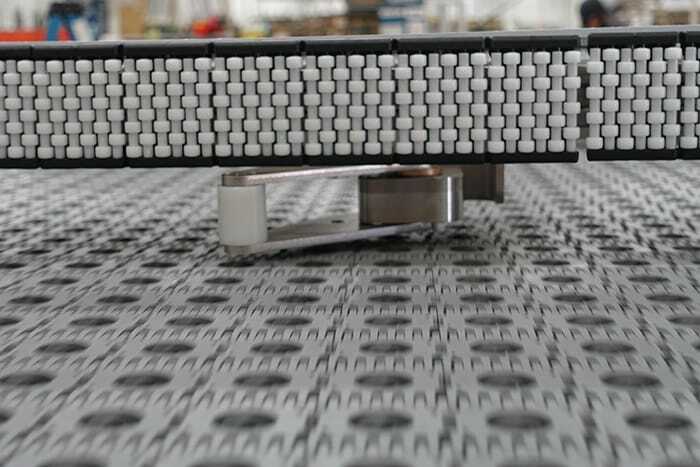 After a row of cases has assembled on the 3200 Series Modular Belt Conveyor, a pneumatic end-stop will lower, allowing the cases to transfer onto the next conveyor. 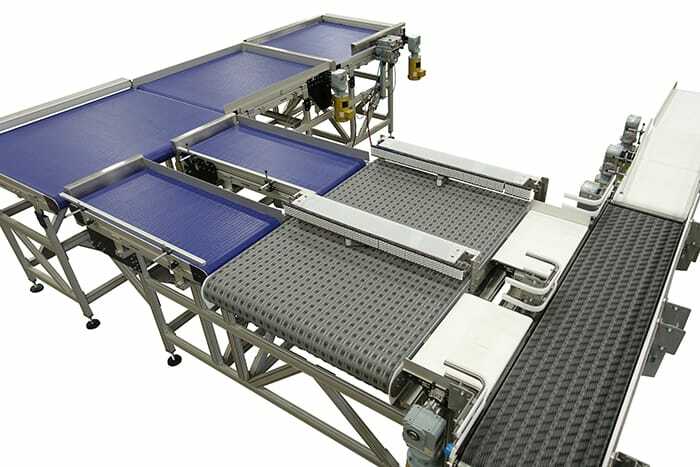 Once the rows from both lanes have been transferred to this conveyor, a pneumatic pusher will activate, pushing the rows to the next conveyor. 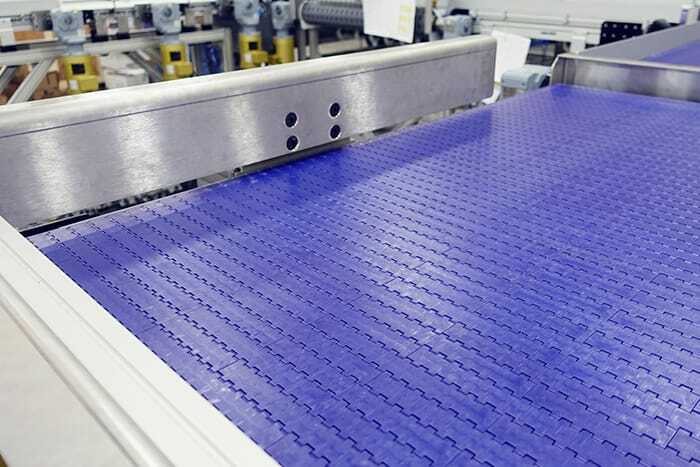 The next conveyor will accumulate the pushed rows until it has received all the rows for that pallet layer. To accomplish this, the conveyor also has a pneumatic end-stop. By having an end-stop before each transfer point, it gives the cases something to justify to and settle against. This will limit the amount of cases shifting in the pattern while they transfer to the next conveyor. 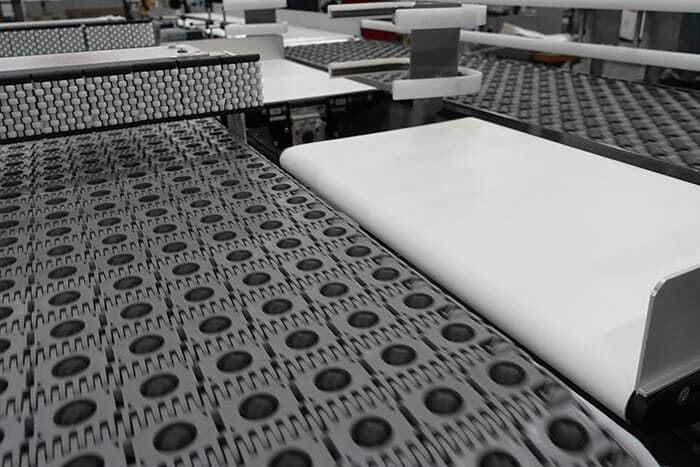 Once all rows have assembled onto this conveyor, the pneumatic end stop will lower, allowing the cases to transfer to the final conveyor. On this conveyor, another pusher will activate to ensure the pattern of cases is compact. Finally, the cases are removed from the end of the line via a robot. See this application in action below or learn more about Dorner’s Product Handling Solutions.